Do you like graphs and numbers? Me too! 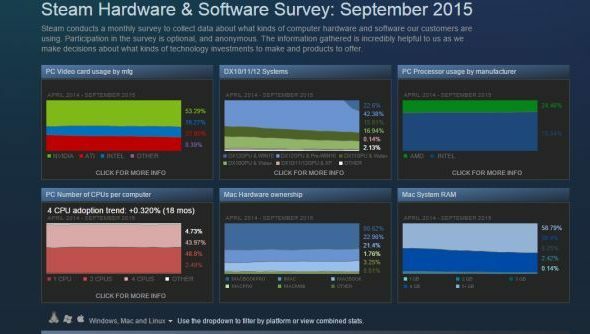 So here’s the Steam Hardware Survey for September 2015, which reveals a couple of interesting facts about gamers as a whole. For example: the vast majority have a better PC than I do, the bastards. More over: my personal pick of Windows 8.1 is in a solid third place behind 10 and 7, because I’m the sort of idiot who upgraded after ages to the one nobody likes. Looking for something to play on Steam? Here’s the best free games on there. Anyway, there’s a pair of interesting statistics here. First, Windows 10 64 bit is up to 23.99% of all Steam users, a growth of 7%. It’s more popular than everything except Windows 7 at this point. People are willing to upgrade their OS, and early, even if they use software that’s very vulnerable to problems when they do so. You’ve just got to offer it to them for free and put an alert in all of their taskbars. With it becoming more and more stable, my own switch is inevitable quite soon. Over in the graphics card section, theNVIDIA GeForce GTX 970 is in second place behind integrated Intel graphics. That’s a new and quite expensive card, and we wouldn’t normally expect it to jump so high in usage so quickly. People are shelling out for upgrades, particulary now that games are starting to transition away from being able to run on the 360 and PS3. While there hasn’t been the sort of graphics bump we’ve seen during other generation-changes, the low and high ends of what’s available have both gone up a notch. Despite the number of people upgrading, 1080p remains the most normal resolution. Having recently switched from a slightly-under-1080p 16:10 monitor to this one, I can’t imagine going any bigger unless I win the lottery. A lot of video already looks a bit dodgy on this and I’d rather turn every other graphics option up than pay out for a 1440p or 4k monitor. Of course, it’s possible people are downsampling higher resolutions and 1080p is simply what they use on the desktop. More info available on the page itself, like the fact that 15% of gamers don’t know if that’s a microphone sitting in front of them or some kind of high-tech dog.